by Eric Allen. 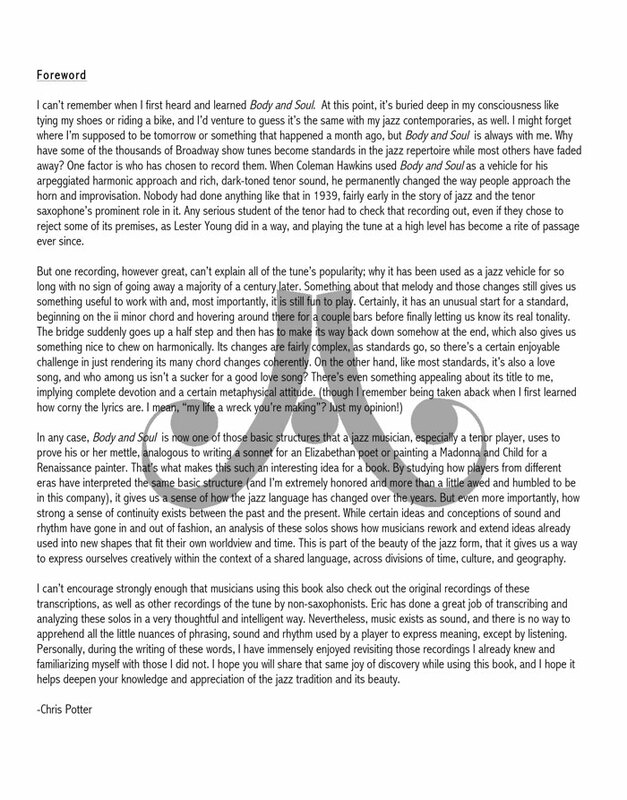 Foreword by Chris Potter. For all serious jazz musicians! From Coleman Hawkins to Chris Potter, the evolution of jazz style and harmony is carefully examined and clearly explained in this monumental work centered around iconic solos on the great standard “Body & Soul.” Includes complete and accurate transcriptions of Coleman Hawkins, Lester Young, Stan Getz, Sonny Rollins, John Coltrane, Dexter Gordon, Michael Brecker, and Chris Potter with both melody and solo choruses. 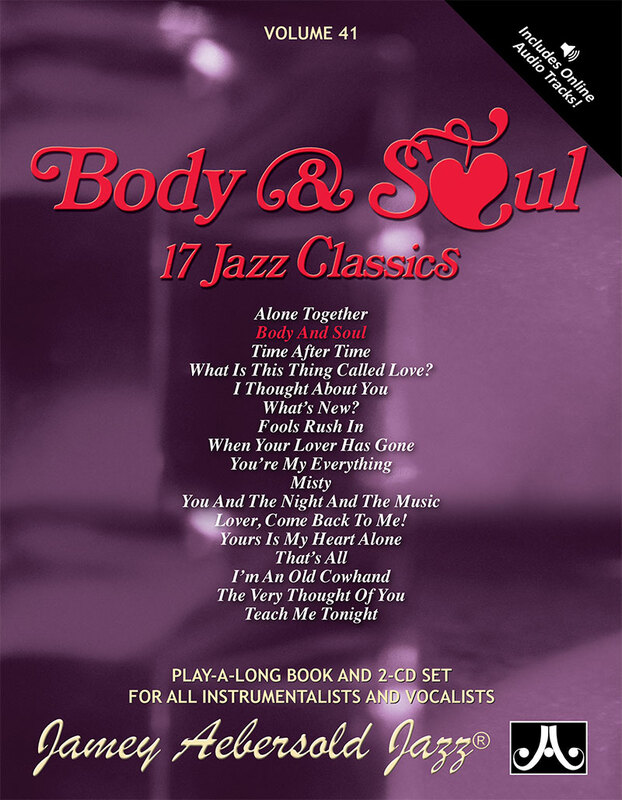 Pages and pages of in-depth analysis and stylistic comparisons for each solo make this an historic treatise on the rich evolution of jazz harmony and interpretation. All the answers are here in this huge 180 page spiral-bound collection! This book is tenor saxophone key, so Bb instruments will not have to transpose. 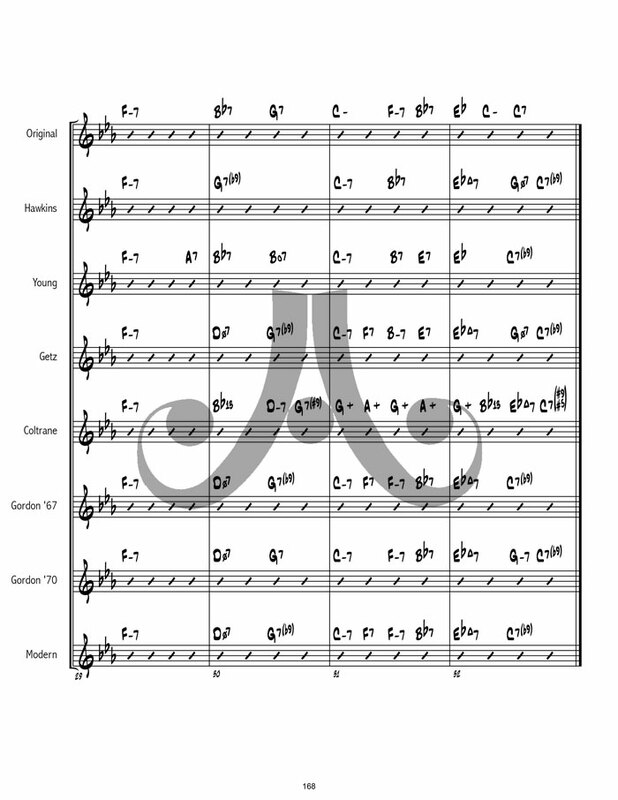 For all other instruments, special transposed supplemental books (sold separately - see the "You May Also Like" column to the right) are available. 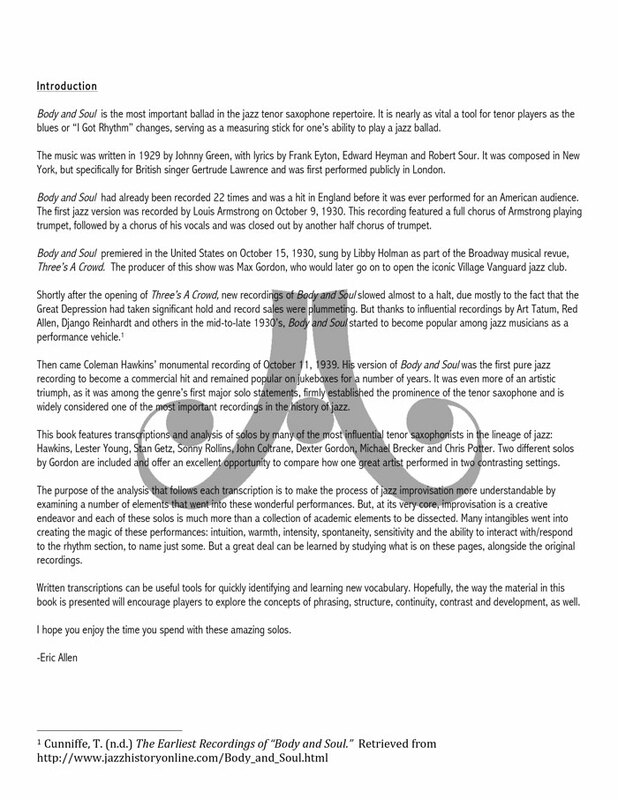 "This is an important new book for every serious student of improvisation. Accurate transcriptions of famous solos by the masters are analyzed to give the student an understanding of how to construct a great solo." 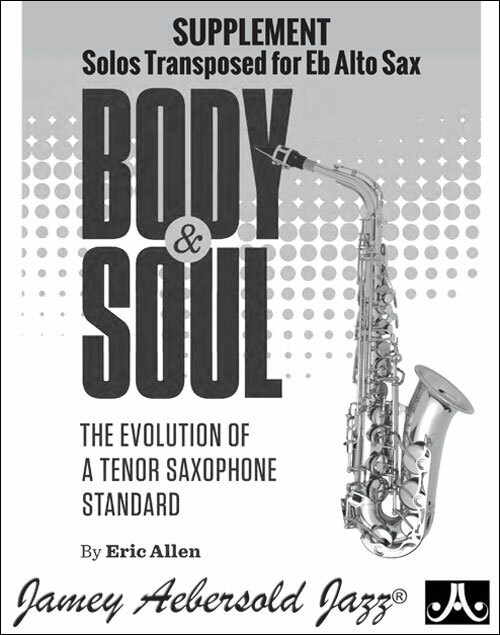 "Author and musician Eric Allen has said in words, music and bound paper what all jazz saxophonists have thought for generations: the story and evolution of improvisation on the great ballad “Body and Soul” IS a reflection of the history of jazz, and in particular the history of the tenor saxophone. 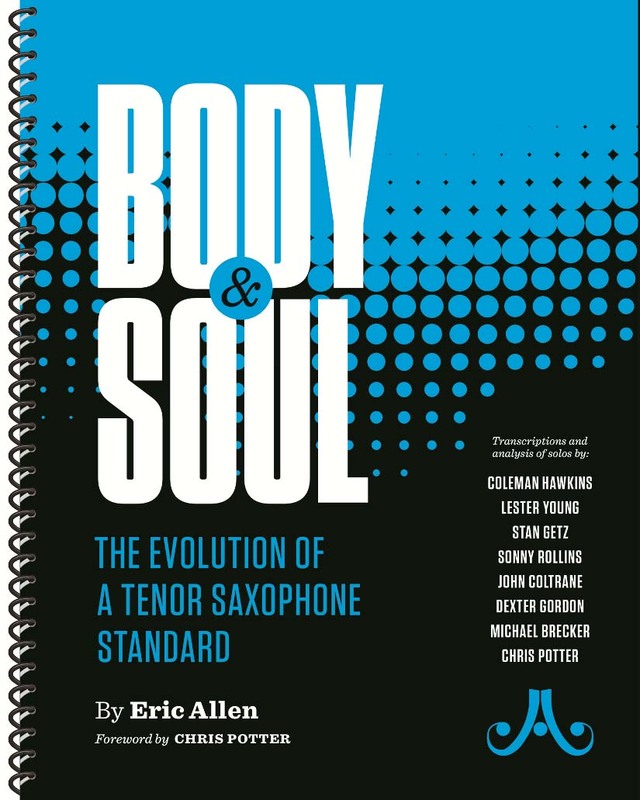 This book contains full transcriptions of “Body and Soul” solos by an A-list of great jazz tenor players. Allen’s first solo selection is the original masterpiece: Coleman Hawkins’ 1939 tour de force that started it all, the solo that issued a challenge to all tenor players after him because of its sheer virtuosity and mastery of the changes. Also included are landmark solos by Lester Young, Stan Getz, Sonny Rollins, John Coltrane, two by Dexter Gordon, Michael Brecker and Chris Potter. 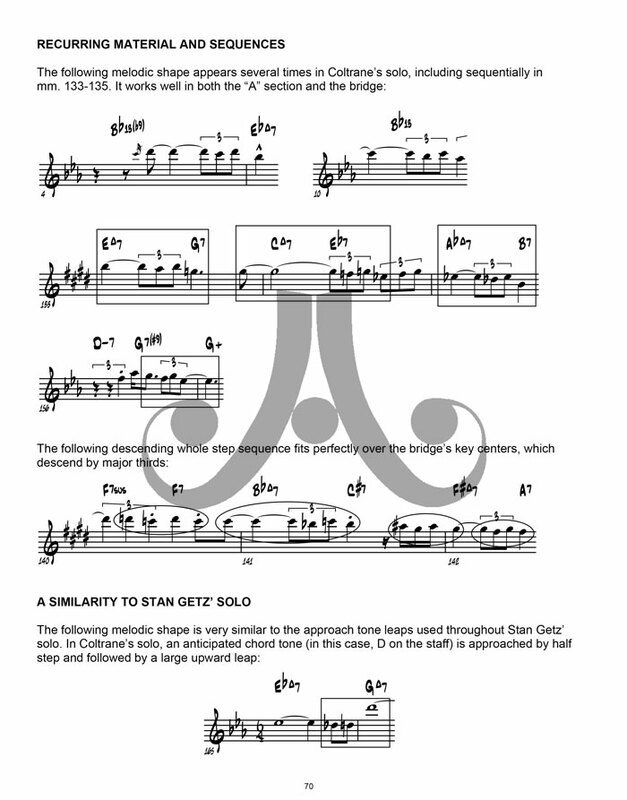 Allen begins the book with a true scholar’s approach: he publishes a facsimile of the original sheet music for the great standard, complete with the 1930 cover from the folio for the show “Three’s A Crowd” that featured this tune and made it a hit. Note: the song also a lovely verse that is omitted here, and is rarely recorded. Allen’s prowess as a historical researcher comes into play as he tells the story of the history of the tune, its recording for the London production of the show, its first recording by Louis Armstrong in 1930 and subsequent versions by Art Tatum, Django Reinhardt, Red Allen and others. 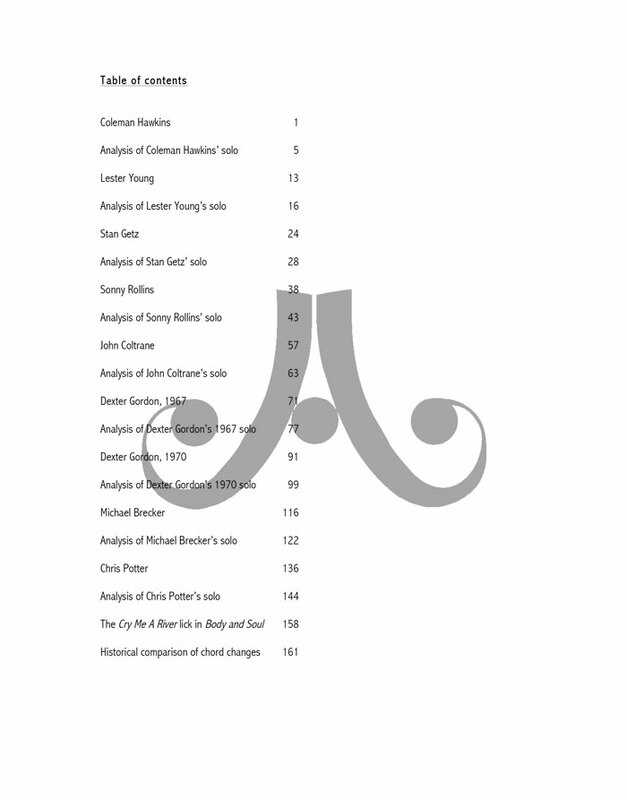 As impressive as it is to see and play all of these landmark solos, it is perhaps equally impressive to read Allen’s incisive analyses of each of them. Each analysis is divided into sections with headings. 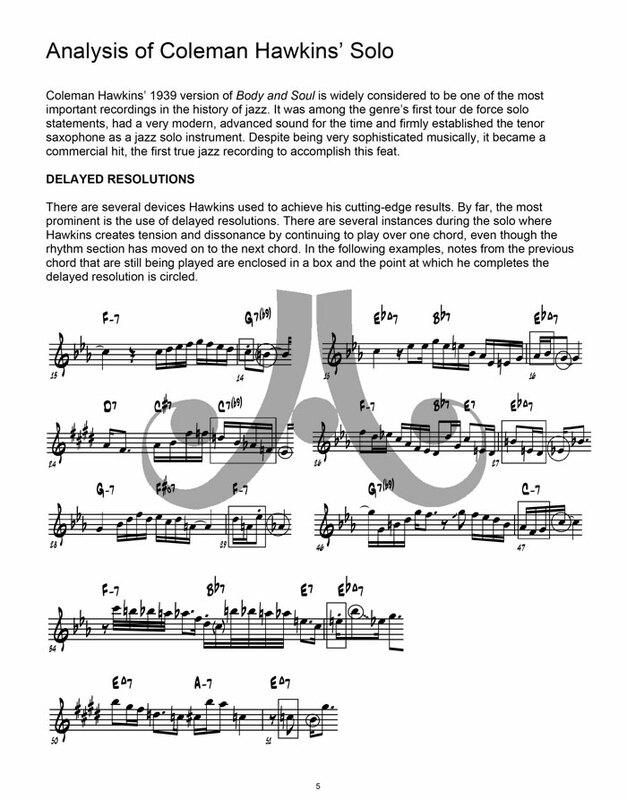 Hawkins’ solo is addressed by focusing on delayed resolutions, chromaticism, hidden harmonic lines, simplicity, development and repetition, arpeggiation, phrasing tendencies, motivic development and sequences. Allen’s willingness to vary his approach in each analysis is the strength of this book. In each case, he lets the solo drive that analysis, rather than conform to a simplistic cookie-cutter approach. For example, the Lester Young analysis concentrates on phrasing and time, enclosures, and alteration of dominant 7th chords. The Getz solo is a story of scale choices and colors, sequencing and repetition of ideas. 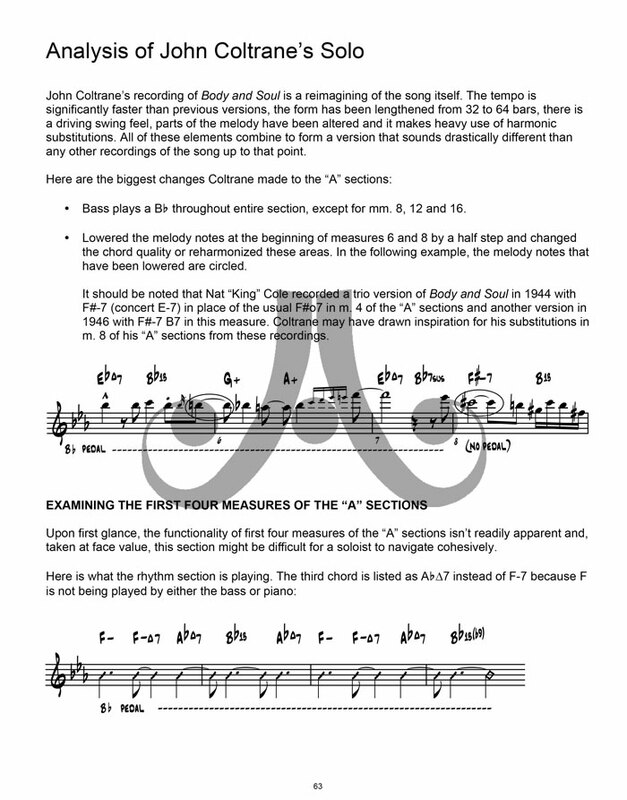 Sonny Rollins’ vocabulary brings in more of a modernist perspective, showing his arpeggiation concluding with 7-3 resolutions, the harmonic minor scale as a Lydian dominant, while the Coltrane analysis concentrates (as it should) as much on Trane’s arrangement as on his solo, bringing together Trane’s modal period in the A sections with his “Giant Steps” thirds period on the bridge. 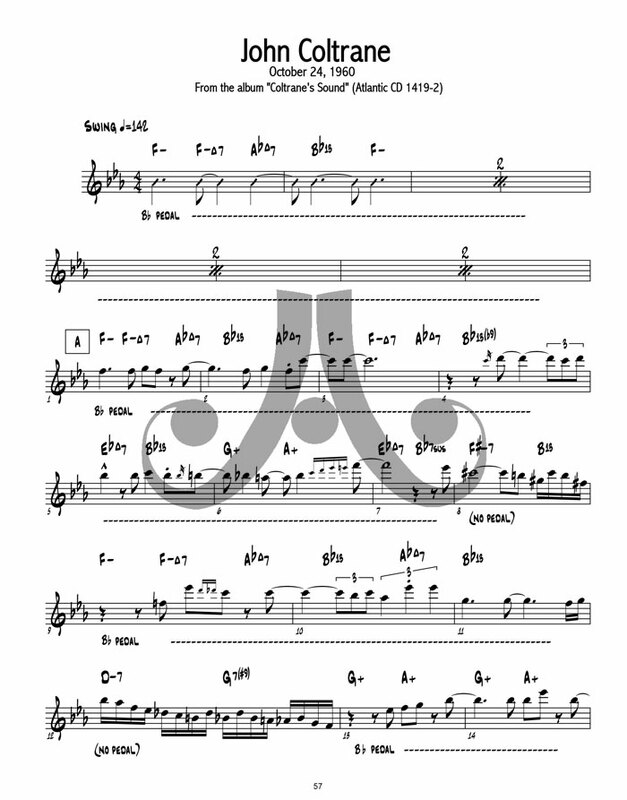 The two Dexter Gordon solos are contrasting in tempo (one is as a ballad, the other one almost double that speed) and in harmony, showing one player’s multiple perspectives on the same tune. The final two solos, by Michael Brecker and Chris Potter, are a showcase of modern improvisational techniques. 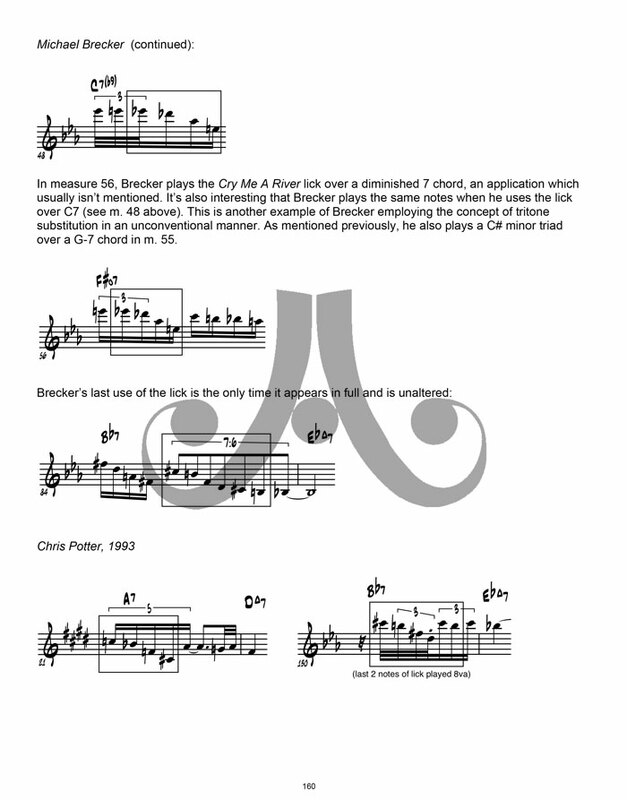 Brecker’s solos displays a variety of alterations, side-slipping (often down a half-step) and his avoidance of guide tones on tonic chords to get an open, modern sound. Potter’s approach is more motive-driven, with each idea there for a reason, sometimes connecting to another idea that becomes a new motive. 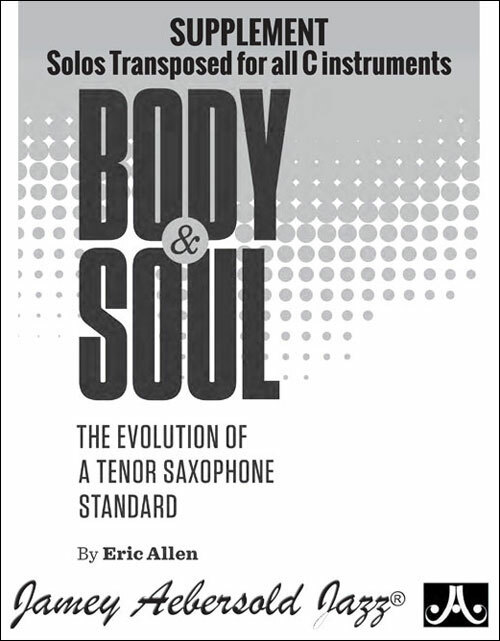 This book should stand as an example not only of great saxophone playing and improvisation, but also of solo analysis through the guidance of Eric Allen. This book is a must-have, and hopefully will be widely used for years to come."